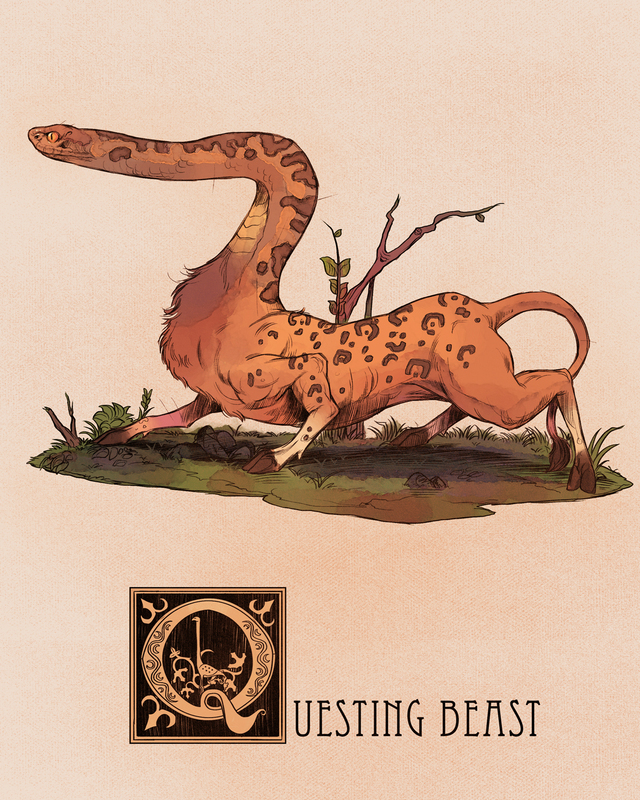 So, this is the Questing Beast / Glatisant. You may remember her from T.H. White's Once and Future King. She is the 5th forest manager. Just 1 more to go, damn my slow pace. Traits: Feline – Acute Hearing, Graceful, Natural Weapons, Night Vision, Rapid Reaction, Wary, Vibration Sense. 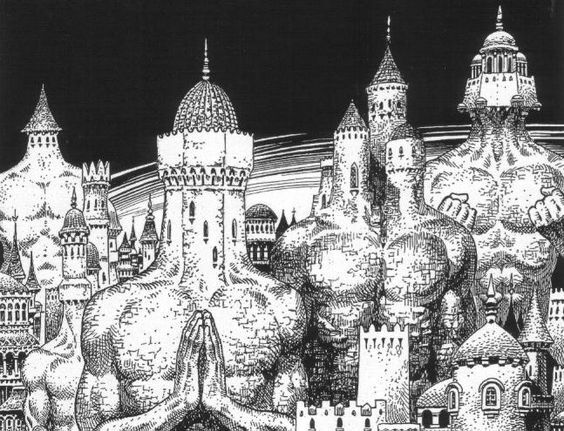 Ophidian – Coil. *****Psi-Talent. *Shock-Wave: When an individual is struck by a shock-wave weapon, it produces a shock-wave that strikes all other targets in a 1 meter radius. Every time shock-wave is taken the radius is increased by 1 meter. The shock-wave does one less die-type than a direct hit. The targets may make Reflexes saving rolls to avoid the shock-wave damage. 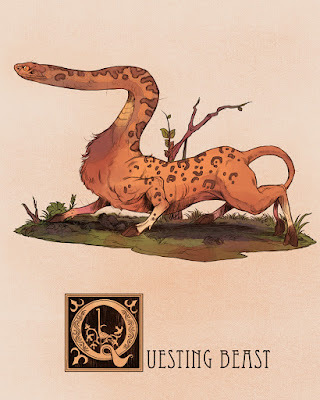 **Poison: Every time a target is struck by the Questing Beast's bite attack, and at least 1 point of damage is suffered after armor protection, the target must make a Toughness save. If they fail their save, they take an additional 1D8 points of damage, this damage cannot be reduced by armor/force-fields/psi-talents. *** Spreading: This ability adds 1 meter to either side of the projectile's/beam's path. The attacker makes a single attack-roll, if the attack roll exceeds the defense score of anyone caught in the path of the attack, they suffer damage as normal. ****Continuous: The attack damages everyone in the path and range of the beam/projectile. The attacker makes a single roll, all those in the path of the beam/projectile whose defense is less than the roll, are hit. *****Psi-Talent: Glatisant is capable of using certain Psi-Talents a set number of times per day and others at will. Caster level is equal to Glatisant Hit-Dice. At-Will each: Bearing and Light-Heal. 4 / Day each: Mindbolt, Beguile, and Sleep. 3 / Day each: Enthrall, ESP, Heat, and Mindwipe. 2 / Day each: Missile Shield, Clairvoyance, Speed, and Suggestion. 1 / Day each: Melee Shield, Intellect Blaster, and Geas. Special: Trippy Bite: Anyone who is damaged by Glatisant's bite suffer from mind-blowing hallucinations if they fail their save to resist the poison. Thunder Hoof: Glatisant's hoof strikes cause shock-waves that damage others who are within 7 feet of the target. Those in the range of the shock-waves may make a save to avoid being damaged. Plasma Spew: The Questing Beast can spew out a beam of plasma like that fired from a shoulder mounted plasma cannon. F'ing With Your Mind Man: Your mind, is her mind's toy to play with. She is capable of dominating the weak-minded, especially the unimaginative. Those that fail their save are forced go on a 'quest' for her. Movement: 200 feet per round Walking. *Poison: Every time a person takes damage from Galisant's bite, the target must make a save versus Poison. Those that fail their save will take 1D4 damage per round for the next 3 rounds. A single target can suffer from 3 doses of poison at a time. Plasma Breath: Every 1D4 rounds the Questing Beast may breathe a 90 ft. long 15 ft. wide line of plasma. The plasma does 7D6 damage. Those that make a successful save versus breath, only take ½ damage. Glatisant may make a breath attack along with her normal attacks. Spell Casting: Glatisant is capable of using certain spells a set number of times per day and others at will. Caster level is equal to Glatisant Hit-Dice. At-Will each: Command and Cure Light Wounds. 4 / Day each: Magic Missile, Charm Person, and Sleep. 3 / Day each: Enthrall, ESP, Heat Metal, and Forget. 2 / Day each: Clairvoyance, Haste, and Suggestion. 1 / Day each: Protection from Normal Weapons, Maze, and Geas.